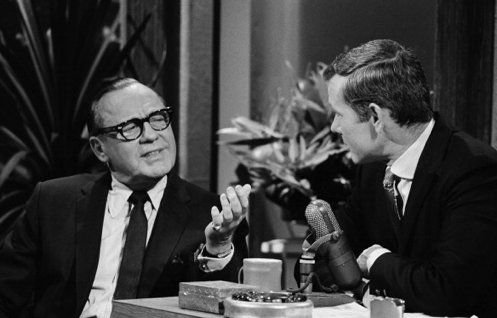 Johnny Carson in vintage Tonight Show interview with Jack Benny. Turner Classic Movies has tapped a motherlode of 50 full-length Johnny Carson interviews with some of Hollywood's greatest stars. A majority of them, like Johnny, are deceased. Beginning next summer, the network will begin airing them under the umbrella title of Carson on TCM. They'll begin as five-interview packages and later air as single-shot bridges between TCM movies "highlighting stars whose films are featured on the network," TCM says in a publicity release. The deal was made through filmmaker Peter Jones, who persuaded the Carson estate to grant him unrestricted access to the "The King of Late Night's" archives for PBS' acclaimed American Masters tribute to him in May 2012. "What Johnny did better than anyone was to engage his guests in wonderful conversation," Jones says. "He listened carefully and made his guests feel as though they were simply talking to a friend." The collection of 50 Tonight Show interviews includes sit-downs with Fred Astaire, Lucille Ball, Jack Benny, Carol Burnett, George Burns, Truman Capote, Bing Crosby, Tony Curtis, Bette Davis, Sammy Davis Jr., Doris Day, Kirk Douglas, Henry Fonda, Charlton Heston, William Holden, Bob Hope, Gene Kelly, Jack Lemmon, Mary Tyler Moore, Gregory Peck, Tony Randall, Ronald Reagan, George C. Scott, Red Skelton, Jimmy Stewart, Elizabeth Taylor, Jonathan Winters and Shelley Winters. ***FX has ordered what it calls a "third incarnation" of American Horror Story, whose ongoing Season 2 is set in an asylum run by a demonic nun. Jessica Lange, who plays Sister Jude and won an Emmy for her Season 1 AHS portrayal of another character, will return in a new guise for Season 3, FX says. It's scheduled to premiere in fall 2013. FX president and general manager John Landgraf praised AHS executive producers Ryan Murphy and Brad Falchuk for the "ground-breaking idea" of rebooting the series in a new setting with new characters each season. At the other end of the TV teeter totter, the Starz network has canceled Boss after two seasons. The series starred Kelsey Grammer as a corrupt Chicago mayor with a fatal disease. There reportedly is a possibility of a two-hour wrap-up movie.